Want to try sandboarding and sand skiing? Well, you guessed it right -- UAE is the perfect place for both these exciting activities. In fact, the UAE deserts offer a tranquil panorama for unleashing your stress as you slide down the golden dunes. 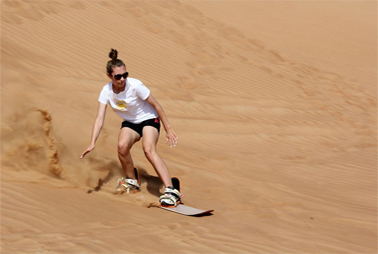 As popular desert sports, sandboarding and skiing are a must-try experience. Don’t fret if you have never stood on a board or ski. Both sports are rough, but the desert is the best place to try them out -- for if you fall, your landing is always cushioned by the soft golden sands. Sandboarding and skiing are year-round recreational activities suited for any age and any level of experience. The sports test your balance and coordination as you strap both feet to a board (or ski) and go down a dune acquiring more speed. The toughest part is when you have to climb up the dune each time, unless of course if you’re lucky and you have a dune buggy! Remember to wear light and comfortable clothes for a hike. You can plan a picnic and carry a food basket with plenty of juices and water to drink. It can be an extremely wholesome experience for the entire family or friends, for that matter. Most safari trips have sandboarding as part of their packages, while sand skiing is offered only by a selected few companies. If you’re going with a safari tour, you will have everything sorted -- from the perfect boarding and skiing location to gears and basic instructions. However, if you decide to take on this challenge on your own, you will need to gear up with special sand boards or skis. The difference between sand boards and skis and that of their snow counterparts is that the former two are heavier and have special wax to make them glide smoothly across the sand. For best sand boarding and skiing experiences, you can take an exhilarating desert safari Dubai that includes several activities like dune bashing, camel riding, and many others. Did you know? Sandboarding was invented in Brazil and is a popular sport around the world from South Africa to Europe. The Annual Sandboarding World Championship is held in Germany. Erik Johnson holds the Guinness World Record for sandboarding at a speed of 82km/hr.